A joint venture of Boeing and Lockheed Martin has been selected to launch a NASA exploration spacecraft to Mars for a two-year study of the solar system’s formation. United Launch Services LLC, part of United Launch Alliance, will send the Interior Exploration Using Seismic Investigations, Geodesy and Heat Transport mission in March 2016 aboard an Atlas V rocket from Vandenberg Air Force Base in California, NASA said Thursday. InSight launch costs are estimated to be $160 million and cover spacecraft processing, payload integration, tracking and data and telemetry. 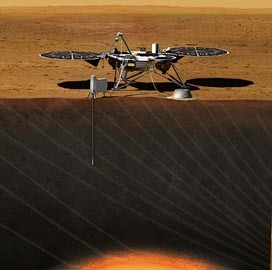 NASA intends for the InSight lander science mission to study how the solar system’s rocky planets formed more than 4 billion years ago. The spacecraft, scheduled to reach Mars in September 2016 for a two-year mission, is meant to examine the evolution of planets by probing Mars’ structure and processes while using two instrument packages. NASA’s Launch Services Program at Kennedy Space Center in Florida is managing the Atlas V launch services and the agency’s Jet Propulsion Laboratory handles the InSight mission.